ble AI340 internalization by astrocytes. associated with the disease pathology . , provided the original work is properly cited. that glial activation can effectively clear AP plaques. clearing debris and possibly promoting repair. as a result of reduced glia phagocytosis. to express mIL-4 in the brains of APP trans! :hat to previous observations . mice injected with rAAV2/1 mlL-4 or rAAV2/1-EGFP (Control). Whole brain sections (E, G) and the corresponding hippocampus (F, H) are shown. expressing mice. (n 4/group; p < 0.05, t test). Data represents mean sem. count for increased AP accrual in mlL-4 expressing mice. compared to controls (n5/group). (*p < 0.05, t test). Data represents mean sem. expressing mice (Additional file 3: Figure S3, C-D). inefficient in internalizing A340 as shown earlier [2,26]. g take by primary astrocytes (Figure 6, D). (mean +sem) was normalized to B-actin in wild type mice cohort (F). (n 5/group; p > 0.05, t test). Tukey's post test). Data represents mean sem. eriments (t test, *p < 0.05). Data represents mean sem. soluble, but not aggregated, A3 uptake by microglia. es were excluded by gating to yield the percentage of fluorescent cells. could provide an explanation for this association. a* : ,-,,,,,1 ,. .,.,,,t,, tis .... ,Iu^^-^ *-, *_..
in many cases this relationship is assumed and ha! followed by 40 amplification cycles of 95 C /1! S. of brain homogenate for .. .:. . SYBR the plaques using Adobe Photoshop CS5. 0m 1 -I 1 -,C ADO -- _- 1. ,--_ -.. Io. kl or ated using Photoshop CS2 (Adobe). [', tTalamus. Scae Bar, 600 Im (A) and 85 Tm (B 1). normalized to p actn (B). (n 5 6/group; t test, p > 0.05). two irdeperdent experiments have been shown. Ig ot Medicine, 4500 San Pablo hd S, Jacksonville, kL 32224, USA. ,tric disease. Neuiobio/oW Dis 2010, 37:503-509.
in situ. No! Med 2003, 9:453-457. Pioc Noil Acad Si U S A 2006, 103:11784-11789.
caspase-dependent mechanism. Neu ioA/i Dis 20 1, 43:6i 6-624.
jniication, 400x (*p < 005; t test). the cognitive decline in a mouse model of Alzheimer's disease. AbstractBackgroundPro-inflammatory stimuli, including cytokines like Interleukin-1β, Interleukin-6 and Interferon-γ, in the brain have been proposed to exacerbate existing Alzheimer’s disease (AD) neuropathology by increasing amyloidogenic processing of APP and promoting further Aβ accumulation in AD. On the other hand, anti-inflammatory cytokines have been suggested to be neuroprotective by reducing neuroinflammation and clearing Aβ. To test this hypothesis, we used adeno-associated virus serotype 1 (AAV2/1) to express an anti-inflammatory cytokine, murine Interleukin-4 (mIL-4), in the hippocampus of APP transgenic TgCRND8 mice with pre-existing plaques.ResultsmIL-4 expression resulted in establishment of an “M2-like” phenotype in the brain and was accompanied by exacerbated Aβ deposition in TgCRND8 mice brains. No change in holo APP or APP C terminal fragment or phosphorylated tau levels were detected in mIL-4 expressing CRND8 cohorts. Biochemical analysis shows increases in both SDS soluble and insoluble Aβ. 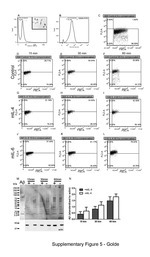 mIL-4 treatment attenuates soluble Aβ40 uptake by microglia but does not affect aggregated Aβ42 internalization by microglia or soluble Aβ40 internalization by astrocytes.ConclusionsShort term focal mIL-4 expression in the hippocampus leads to exacerbation of amyloid deposition in vivo, possibly mediated by acute suppression of glial clearance mechanisms. Given that recent preclinical data from independent groups indicate engagement of the innate immune system early on during disease pathogenesis may be beneficial, our present study strongly argues for a cautious re-examination of unwarranted side–effects of anti-inflammatory therapies for neurodegenerative diseases, including AD. Paramita Chakrabarty et al. ; licensee BioMed Central Ltd.